The Rapoo VPRO V26S tries to make its place in the entry-level segment and brings some worthy pointers. 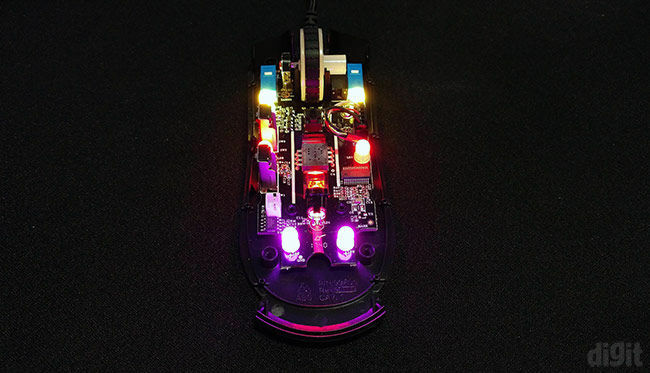 In terms of looks, the mouse is illuminated with six RGB LEDs beneath a mesh pattern on the top. It definitely looks attractive with the RGB lighting that keeps cycling in a rainbow effect. A DPI button on the top allows you to switch between the seven DPI values up to around 3800 even though it advertises to reach a DPI value of 7000. When you cycle through the DPI values, all the LEDs blink a few times in different colours for every DPI value. However, once it has been set, there’s no way to determine the active DPI value. Another day, another budget gaming mouse. While several of these flooding the online marketplaces are terrible in build quality, there are a few that stand out. The feature set doesn’t necessarily differ by much but you get slightly better and reliable build quality. Rapoo has been trying to win in this budget with a range of peripherals including mice, keyboard and keyboard/mouse combos. 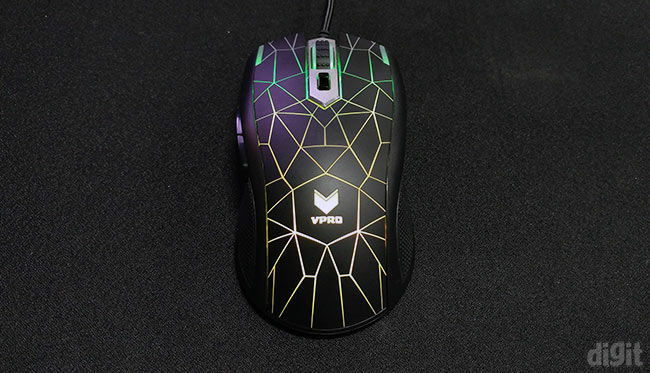 With their gaming brand VPRO, they are targeting gamers with these peripherals. 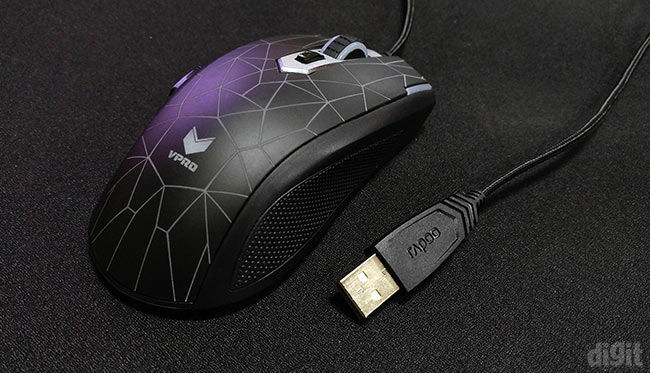 The Rapoo VPRO V26S is another mouse from their line-up that consists of an entry-level sensor and basic features. We will be exploring whether it’s just another mouse in this crowded segment or whether it has something extra or unique to offer. Entry-level mice or even gaming mice don’t really pack many features. Looking at the product page of the VPRO V26S, we were amazed to notice some of the few features listed. However, it was disappointing at the end that we will be discussing. It has an ergonomic design with rubber grips on both the sides. The mesh pattern on the top looks great with the RGB illumination beneath it. The lighting effect can’t be controlled even though they state that the lighting is customisable. It only changes for a few seconds to indicate the active DPI value and goes back to the rainbow cycling effect. Apart from the left and right buttons, you get additional buttons for forward and backward, DPI switch and the scroll wheel. The product page mentions that five buttons are customisable even with macros. However, there isn’t any software support on their website and no mention of how the buttons can be customised. The DPI switch button cycles through seven different values. But the website goes on to mention about 14 values with a maximum of 7000. During our performance testing, we learned that it doesn’t even touch 7000 and most of the listed values are inaccurate. Also listed on the website is support for onboard memory where all the different configurations can be saved. 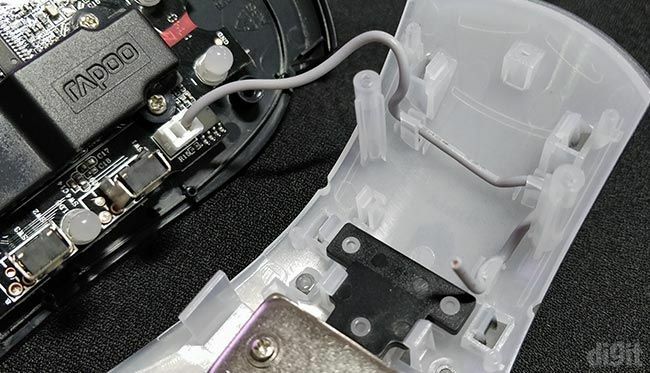 This usually isn’t found on budget gaming mice and we were excited to come across this feature. After opening up the mouse, we did find a flash memory chip on the mouse but couldn’t find any download link for the mouse utility software. With the absence of any software, it isn’t possible to customise and save mouse configurations onto the mouse. Browsing through some of the features of the mouse and realising that they aren’t actually supported was disappointing. 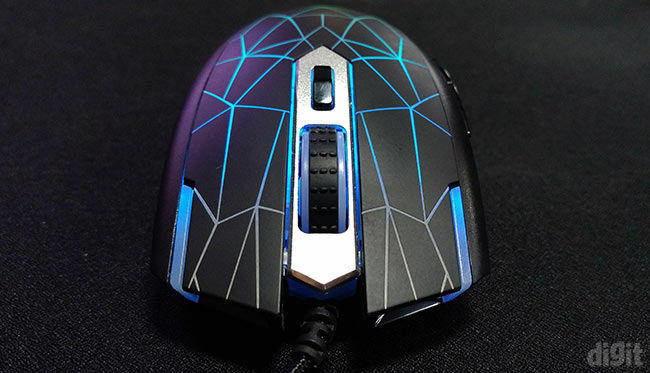 However, these highlighted features are usually found on mid to high-end mice. If these aren’t considered, all the basic features of functioning as a mouse are still present on the VPRO V26S. 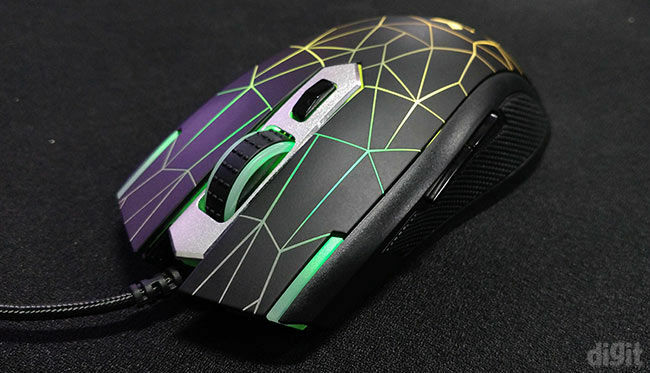 Built from plastic, the top part of the mouse is given a matte coating. 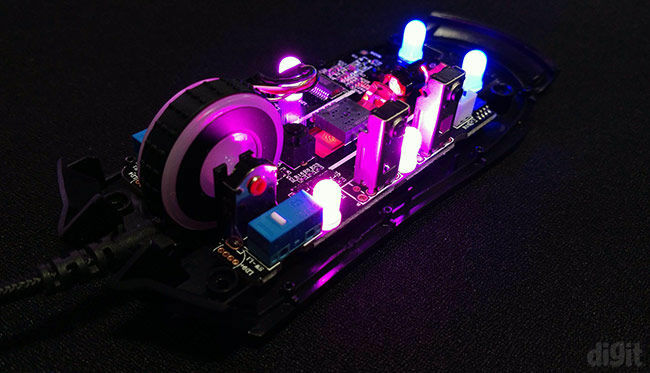 This is where the mesh-pattern has been implemented through which the RGB lighting emits out. The diffusion in the mesh-pattern is enough to make the illumination look beautiful without blinding you. Inside the mesh design, you will find the VPRO logo. The mouse’s ergonomic design does give you a nice and comfortable grip. Because of the long and steady curve on the top, it’s best suited for a palm grip. 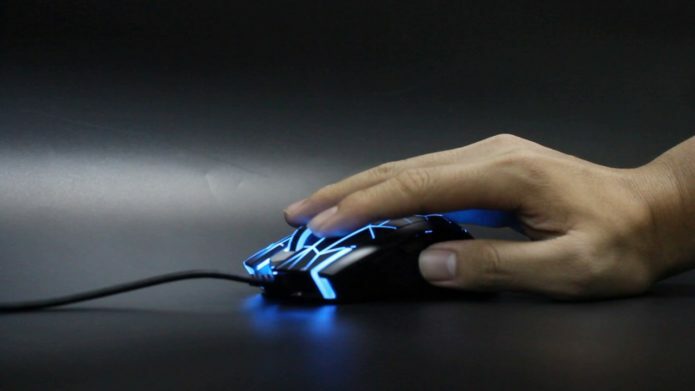 However, the steep curve at bottom of the mouse and the outward curves from both the sides make it comfortable for a claw grip as well. On the sides, a textured-rubber pad has been attached for better grip. It does offer you a good grip while gaming but if you have sweaty hands, it starts slipping. The pad goes all the way to the bottom end of the mouse so when you’re holding the mouse in a palm grip, your fingers will be resting all over the pads. The scroll wheel has rubber padding as well. There’s a slight step resistance to rotating the wheel. Although it’s subjective, we would have preferred something more prominent. 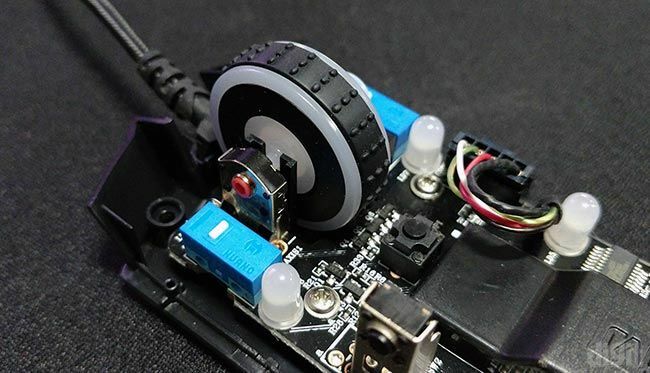 The scroll wheel is clickable and it uses a TTC microswitch. We weren’t really happy with the flexibility of the cable. It was too stiff to handle but Rapoo included a velcro strap for cable management which was helpful. 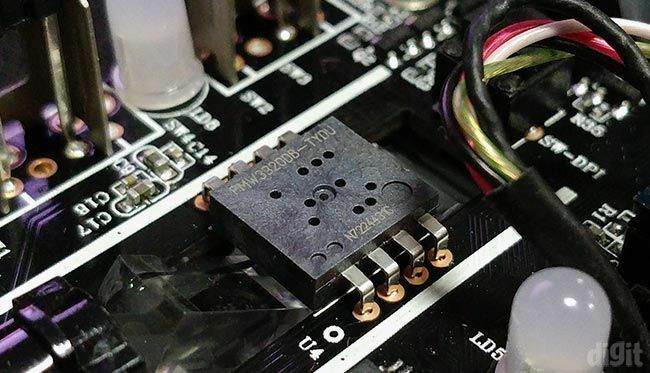 The USB connector is gold-plated so it should provide better durability from rust and corrosion. The four PTFE feet on the bottom provided good enough glide for the mouse. Do note, they have a plastic cover on them that should be removed to take advantage of the smooth feet. 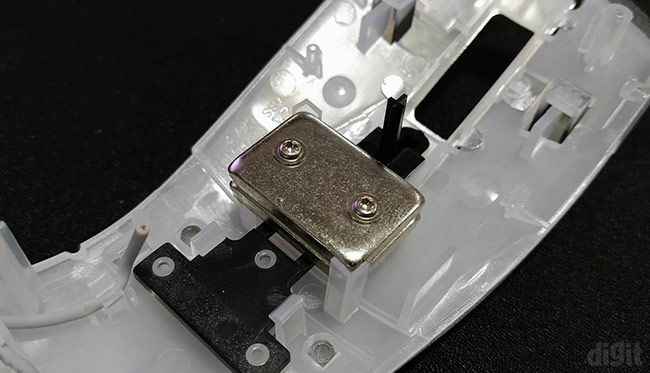 To get access to the interiors of the mouse, you will have to remove all the mouse feet and remove the four screws. 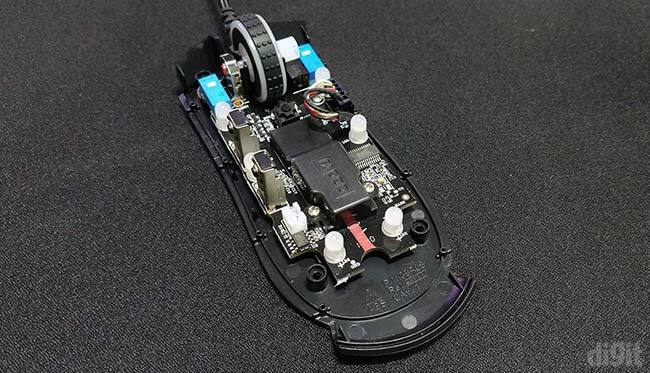 The mouse has four different parts including the two sides with the rubber pads, the top mesh design part and the bottom piece holding the PCB. Opening the mouse isn’t an issue. On the top cover, we find two metal blocks screwed in that gives the mouse some weight. If you aren’t comfortable with the current weight of the mouse, you can remove them. 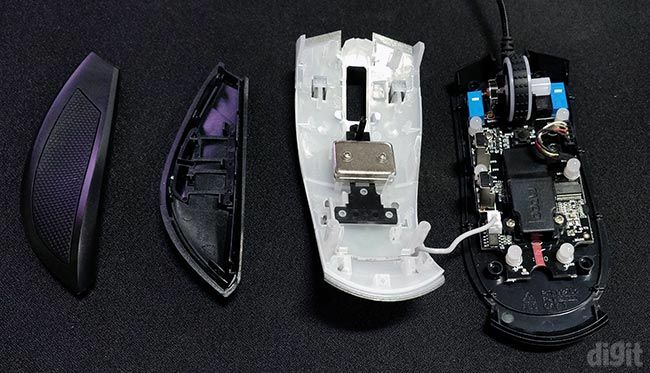 However, since you need to take apart the mouse in order to do so, it isn’t that user-friendly. We noticed a cable connected to the PCB that end in the top cover to nothing. We aren’t really sure what they were trying to achieve. Our guess is it’s a cable to connect LEDs that were intended to be installed on the top part in an earlier design. 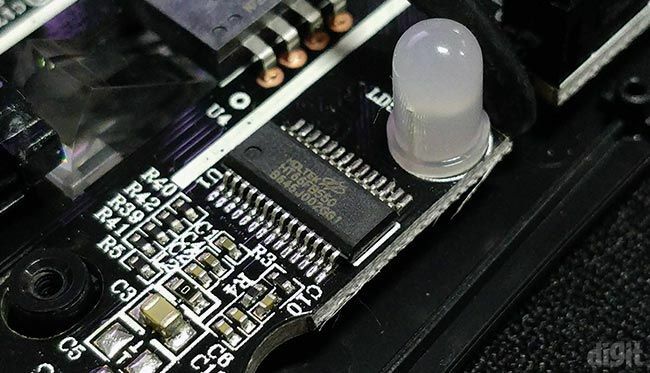 Coming to the PCB, we find six RGB LEDs neatly soldered all around it. The optical sensor is covered with a black shield. This has been probably done to ensure that the bright light from the LEDs doesn’t mess up with the sensor’s tracking. The cover can be easily removed using the two screws. Opening up the cover marked with the Rapoo logo gives us access to the mouse’s optical sensor, prism and the infrared LED. The PMW3320DB-TYDU optical sensor has a resolution of 3500 CPI and a maximum acceleration of 80g. This is where all the tracking happens. To the right of the optical sensor, we found a Holtek HT66FB550 flash memory chip. This means that the mouse is capable of storing data but with the absence of any utility tool, this goes to waste. 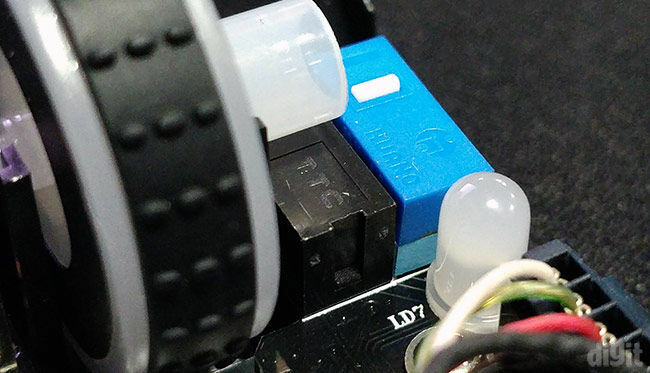 The left and right clicks use Huano blue shell white dot microswitches. These switches are rated for a lifecycle of 20 million clicks. Hence, we were really surprised to find them in a budget gaming mouse. Compared to other budget mice at this price, these switches will last you way longer. The DPI switch, forward and backward buttons use regular tactile switches. Before running the benchmarks, we verify whether the DPI levels are as advertised by the manufacturer. 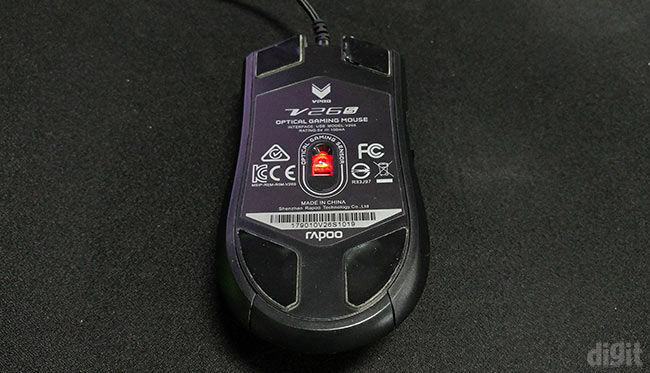 The website states that the mouse can be cycled through seven DPI values up to 7000. 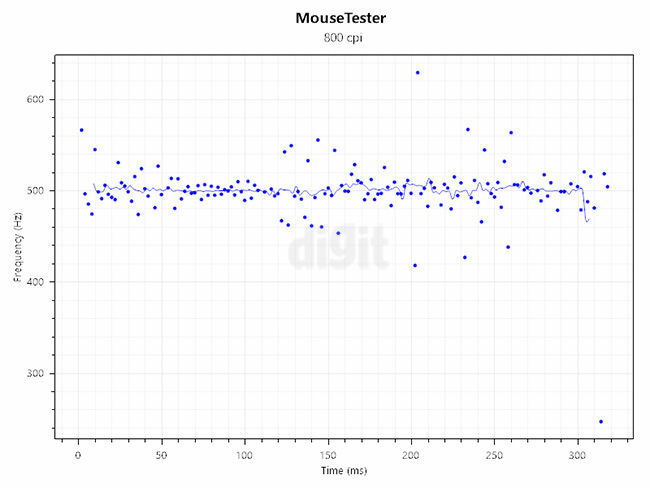 While testing the sensor, the mouse didn’t even reach the 7000 DPI level. 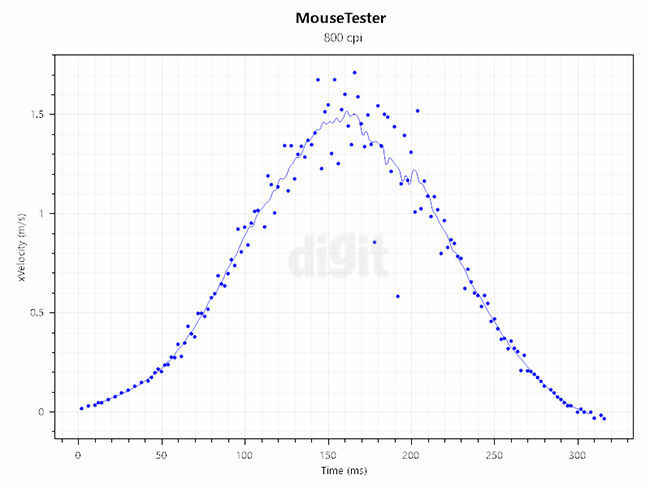 Across the seven levels of DPI, we recorded the following values – 600, 1200, 1400, 1800, 2400, 3200 and 3800 – on Enotus Mouse Test. 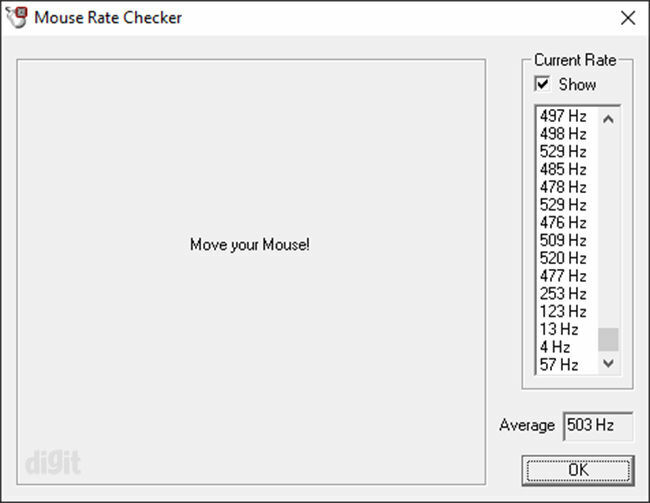 We ran the mouse through Mouse Rate Checker and found the polling rate to be 500 Hz contrary to the 1000 Hz specified on the website. Next, we move on to test whether the sensor incorporates any kind of acceleration. 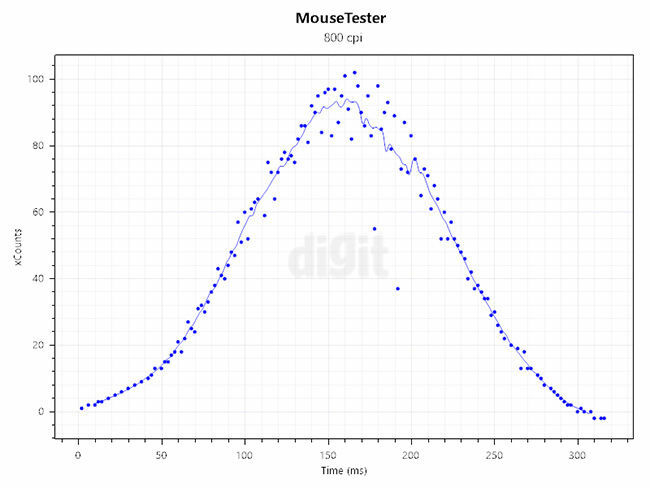 On MouseTester, we found positive acceleration to be present in the sensor. This will only be a problem if you play FPS games with fast swipes on the mouse. Otherwise, you won’t even notice the acceleration occurring. Angle snapping or smoothing isn’t present at the lower DPI values where you’ll be using the mouse. It kicks in at the sixth level which is at 3200. So, you don’t really need to worry about it as long as you’re playing at the lower DPI levels. The maximum tracking speed is highly affected by the surface. In our tests, we use three different surfaces including a smooth white desk and two mousepads including the Zowie GTF-X and Razer Goliathus Control Edition. We found varying tracking across all the surfaces, the smooth white desk recording the highest of 4.51 m/s or 178 inches per second (IPS). However, this isn’t the regular surface on which gamers would be playing. For a more common perspective, our benchmarks also include the mousepads. The Rapoo VPRO V26S displayed a maximum tracking speed of 1.88 m/s or 74.02 IPS. This is quite normal for a sensor at this price. In MouseTester, we observed that the sensor starts losing tracking at a speed of around 1 m/s while at anything above 1.5 m/s it gets worse. 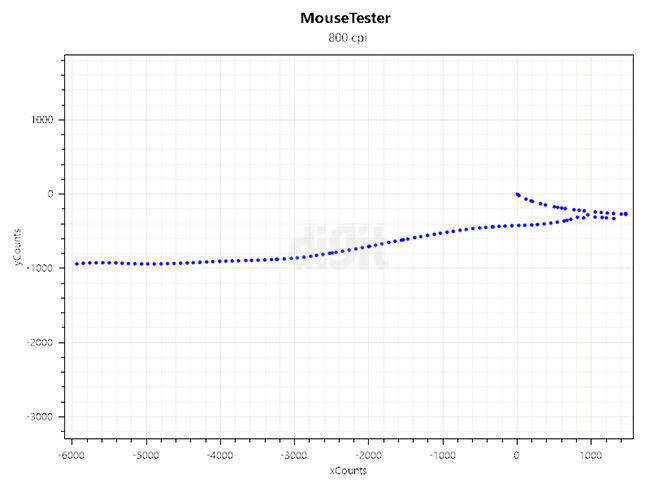 Sensor tracking decreases as the speed of the mouse movement increases. This means that the mouse is moving so fast that the sensor isn’t able to keep up. Naturally, the sensor spins out at much higher speeds. This would be a deal-breaker for gamers who swipe their mouse fast while playing. However, it all depends on your playstyle. That was all for what we observed in our objective testing. Talking about subjective testing, as a casual gamer, you won’t face any glaring problems. We were still able to aim properly and land headshots in first-person shooters. As you already know the mouse is slightly bigger, so it’s going to be more comfortable for bigger hands. It would have been better if the cable was more flexible since it tends to drag on the surface.